The economic impact of Hurricane Florence is unlikely to be large but could muddle U.S. data for months, judging from past experience. Last year, Hurricanes Harvey and Irma constrained activity in the third quarter of 2017 and sparked rebuilding later in the year and well into 2018, making it hard to get an accurate and timely assessment of the impact on quarterly gross domestic product growth. That will be a challenge again with Florence, forecast to be the worst storm to hit North Carolina in 64 years, and the storm season is far from over. Data on employment, consumer spending and manufacturing may also become trickier to analyze as economists gauge impacts of tax cuts and a trade war. When Harvey made landfall on Aug. 25 along the Gulf Coast in Texas last year, initial filings for unemployment benefits surged in the week ended Sept. 2 by the most since November 2012. Applications had similarly jumped following Superstorm Sandy’s hit to the Northeast in 2012. Any spike this time would be temporary, and unlikely to cause concern, as jobless claims are at the lowest level since December 1969. Based on consumer purchases that won’t be made as a result of the storm -- such as canceled events and missed dinners out -- Florence may have a US$700 million net negative impact on the U.S. economy, not counting insurance losses, according to weather-analytics company Planalytics’ initial estimate. “If you’re a mom-and-pop and you happen to be in harm’s way, this could be devastating,” said Evan Gold, executive vice president at Planalytics. Florence is “going to be big, and it’s going to be notable, but I’m not sure it’s going to be as big as others” such as Sandy. Bloomberg Intelligence analysts reckon retailers’ sales of food, water, home-preparation items and cleanup supplies will rise both ahead of and immediately following the storm, but purchases of more discretionary items, including restaurant visits, apparel and home decor, are likely to diminish. Automobile sales may be worth keeping an eye on: They took a hit in August 2017, then rebounded to a 12-year high in September as Americans replaced damaged vehicles. 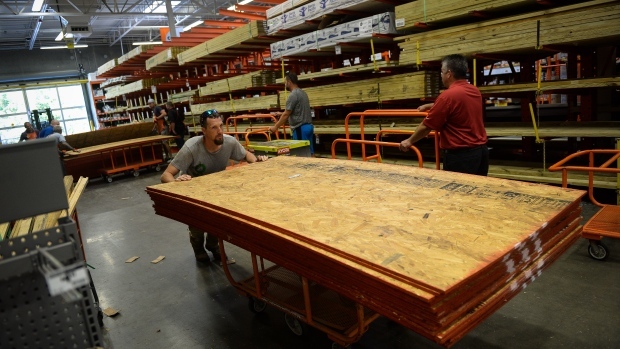 This year, the hurricane’s effects are already being felt in the stock market, with shares of home-improvement retailers Lowe’s Cos. and Home Depot Inc. rising while insurance companies decline. Florence could affect millions of workers in the southeastern U.S., with North Carolina, South Carolina and Virginia forecast to be hit the hardest. According to the Labor Department, flood-zone counties in the states have more than 42,000 establishments employing 682,179 workers with a quarterly payroll of $7.4 billion. After hurricanes Harvey and Irma last year, the initial reading on U.S. payrolls showed a decline of 33,000 workers in September, the first pullback since 2010. The tally has since been revised to a gain of 14,000 jobs, and net hiring rebounded to 271,000 in October 2017. About 1.5 million people were unable to work due to bad weather during September 2017, a 21-year high, and restaurants and bars, an industry where most workers only get paid if they show up to work, were particularly hit. Wages may show some impact too: Last year, the hurricanes boosted utility workers’ overtime pay and kept people away from work in low-wage industries such as leisure and hospitality. Industrial production is another indicator to watch. It declined in September 2017 before surging in October as output at oil refineries and petrochemical plants returned to normal operations following Harvey-related flooding in the Houston area. New-home construction also is sensitive to the weather. Residential starts were initially reported as a decline in September last year after Harvey and Irma. --With assistance from Alex Tanzi.